This Google Custom Search feature will display the results of what Google has indexed from the 492ndBombGroup.com website. Although Google has crawled much of this website, and does so on a regular basis, it certainly has not indexed it all. The degree to which you might find this useful is hard to say. 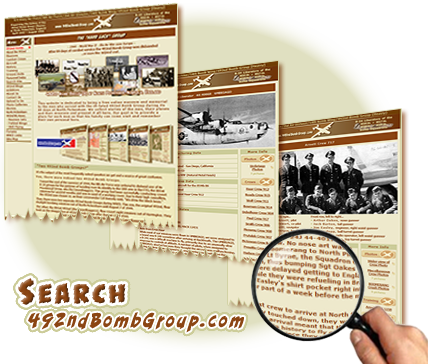 Truth is, our Personnel Index does a crackerjack job of letting you hunt down someone that served in the 492nd Bomb Group, leading you to a logical starting point for that man. Page last modified Saturday, August 7, 2010.